When I was a young Journalism major at Seattle University, I idolized Hunter S. Thompson. It wasn't that I ever read much of his work. But the concept of "Gonzo Journalism" truly seemed to have been invented for me. I hated the strict journalist principles that required you to be objective and distant from your stories. Hunter broke that rule big time and freed many of us from that blazingly boring way of writing. And now he has gone and truly become not part of the story, but the story. Hunter S. Thompson is dead. He shot himself in the style of another much touted writer of our time -- Ernest Hemingway. Perhaps the message here is that, in the end, drugs, alcohol, violence and insanity didn't really work for Hunter or Hemingway. I really can't tell you much about Hunter S. Thompson. There are fan sites out there if you want to know more about the minutiae of his life. Check out http://www.gonzo.org/. I do know that he brought a much needed sense of absurdity into world. I do know that the movie fashioned after his book Fear and Loathing in Las Vegas is one of my favorites. Talk about absurdity. I will always appreciate that great scene where Johnny Depp (playing Hunter S. Thompson) wakes up in a flooded hotel room, a tape recorder strapped to his chest and giant lizard tail strapped to his rear. That's a classic. 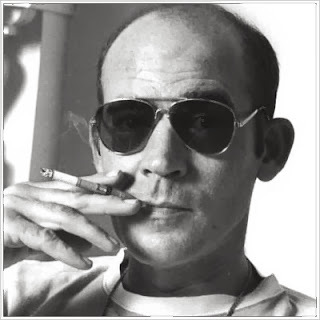 My images of Hunter S. Thompson are just the bits and pieces that have cropped up in the press over the years...images of an unintelligible man standing outside his home in Colorado randomingly popping off rounds from what I believe was a .44 Magnum. I've seen the photos of him shooting a typewriter with a shotgun and read of his fondness for shooting random objects with his gun collection (I used to share this particular obsession years ago on trips into the desert outside Reno with my old friend Michael J, but that is another blog). I don't know why Hunter killed himself. I've read the many dissections of life and death crafted by not-so-Gonzo journalists. There is much talk about him peaking creatively in the 70s and producing very little since. There is also much talk about him no being able to deal with becoming a living "cartoon" character, having served as the inspiration for a Doonsebury character. I don't even image that if I knew Hunter, I'd have been able to tell you why he killed himself. But I suppose if you have enough unexorcised demons fired up with mind altering substances and surrounded by a ready supply of guns, you will eventually use a bullet to rid yourself of them. I do know that it saddens me that Hunter is dead. And I truly hope that he somehow finds peace.